At a dairy farm in Den Bommel (NL), the gas meter recently passed the first 10,000 m3 of biomethane injected into the grid. Since October, the plant is up and running and producing biomethane out of 100% cattle manure with direct injection into the national gas grid of the Netherlands. In a Microferm digestion plant built by HoSt, 8,000 tonnes of cattle manure is digested annually. The amount of produced natural gas is 200,000 m3 annually, which is equivalent to the consumption of 125 households. Unique to this project is the valorization of the biogas. After the upgrading process, the gas is fed directly into the gas network, whereas before the biogas was primarily used to produce electricity and heat. It is the first plant where 100% manure is digested in combination with the production of biomethane on this scale. For the upgrading of biogas on such small scale, HoSt is awarded with the Jan Terlouw Award, a Dutch innovation award, in 2012. 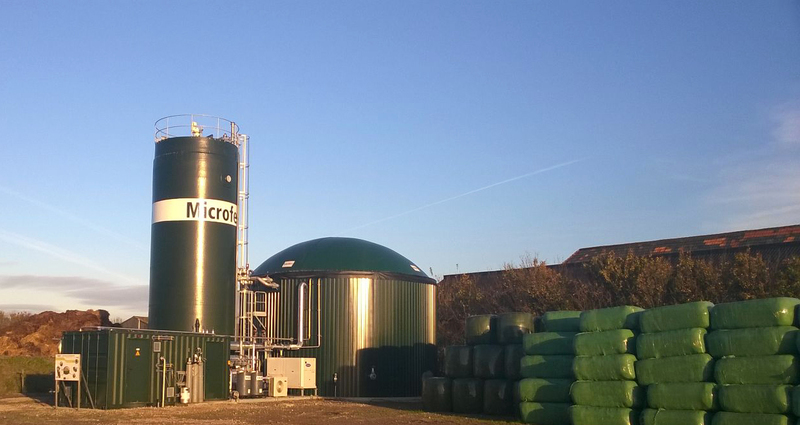 The Microferm concept focuses on the digestion of 100% manure on farm-scale, without adding co-flows. Meanwhile, HoSt has built several Microferm digesters in The Netherlands, France, and Germany. The plant at the farm in Den Bommel consists of a Microferm digester, gas tight after-storage, and a container containing the upgrading unit, control system and a heat pump. The advantage of the production of gas of natural gas quality is the maximum energetic efficiency, which is considerably higher than when producing electricity.